I can't believe it's 2017! Happy New Year Everyone! I'm a little behind compared to everyone else's Christmas Day vlogs but last week I posted a bunch of my pre-Christmas parties in one vlog so click here for that. But as it's Monday, this week's vlog is Christmas Day. Yey! Click here to watch the vlog or watch below. Even though I went to bed super late (3am!) I still woke up super early for some reason and I have no idea why. I had a bit of a nightmare but I still should have been able to get back to sleep. 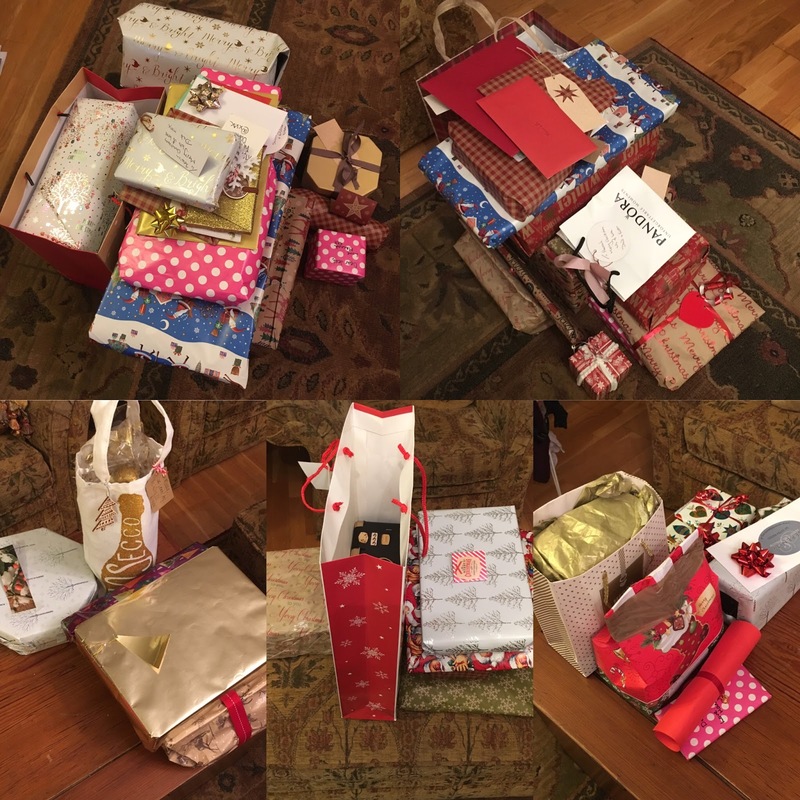 Unfortunately, I think I was a little bit too excited for Christmas and presents. Mum was awake when I first woke up to put the turkey on but while she was able to fall back to sleep, I was not, so I ended up watching and catching up on all my YouTube subscriptions which was nice. After being up almost 3 hours, Jessica still wasn't asleep so mum and I decided we would get ready for the day instead. We usually open presents in our PJs which I've always liked but it did save a lot of time later. I decided to wear my Simply Be, Louise Pentland aka Sprinkle of Glitter, lace blue dress which I've loved since my lookbook! I wore my normal evening makeup look and had my hair curled from the night before. I've defintely found my new favourite place to take pictures! Jess woke up just as I was finishing getting ready and as she didn't want to be the only one not dressed, we had to wait a little longer but then we opened presents! I got so many more than I anticipated. I even wrapped up a couple for myself s I would have something to open. I was thrilled mum liked both of my presents to her and I can't wait for the summer trip. Click here for my full present haul. While Jess went to finish her makeup, mum and I finished up the food but most of it was just to cook because mum did all the actual preparation yesterday, which always works out quite well. Mum's a little bit of a stressor and panics when it comes to timescales so I think if she didn't, it wouldn't be enjoyable for anyone. One of my favourite presents were the home movies that we opened on Christmas Eve. I've wanted the videos converted to DVDs for ages and so it was really nice to finally have them. We started watching them the day before but then continued watching them this morning. Grandma came a little early and so we watched some more before everyone else came. After chatting for a little bit, it was time to eat! I loved my bacon, Yorkshire puddings and pigs in blankets. Belissimo! We ended up having a little break to watch the Queen's speech and then we ate desserts. I had the yule log but others had the Christmas pudding. I cut most of the scene out but we ended up setting a pan on fire! Mum lit it while the brandy was still being poured from the hot pan and the whole thing lit up in flames. It was very loud; a lot of screaming and instructions frantically being yelled. As has become tradition, we ended up playing a game of poker. The first handful of times I played, I literally won every time but recently - as with most things - I've been on a losing streak. I even went out first. Grandma gave up half way through and purposefully went all in on a terrible hand so she could watch Strictly Come Dancing. That's just like her! I ended up watching her and seeing Frankie Bridge dominate but loose nevertheless. I just love spending Christmas with close family. I don't remember ever spending Christmas with my older sisters but from videos and stories I know we did. I think the last time was when I was 5 though so I don't have any memories of them. It's always made me kind of sad. Since my parent's divorce, I haven't had it with my dad either but for the first couple of years, he did come over in the morning to open presents. It actually makes me kind of sad because he never even asks if we want to go to his but hey ho. Maybe one day we will all spend it together again. It would defintely be a dream come true for me. A lot of people ended up having a little nap in the middle of the day while watching The Lion King. My mum. grandma and I instead stayed in the kitchen to clean up but we had Frozen on in the background because my mum had never seen it. The funniest thing was when I went on snapchat and my grandma didn't understand it at all! She was amazed that she had a hat when she didn't and I found it absolutely hilarious. I didn't actually record many of them but there are a few clips in the vlog. We were mostly just laughing at her reaction to all the different filters and just messing around flipping between them all. We were going to play some family games but everyone seemed to leave suddenly so that was put on hold. Instead I watched Call the Midwife with mum and then everyone had a pretty early night. I started editing the vlog and pictures but ended up watching a film in bed. Nice and cosy so a perfect way to end the day. I hope everyone had a Merry Christmas and will have a Happy New Year! How did you celebrate?